The school year at Happy Valley Ranch Preschool runs from September - May. We offer morning and afternoon classes. Morning classes are 3 hours long and afternoon classes are either 2 hours and 30 minutes or 2 hours and 45 minutes long. Children may attend 2, 3 or 4 days a week. Our theme based curriculum is geared toward helping children develop literacy, math and science concepts as well as fostering creativity, social, emotional and physical development. 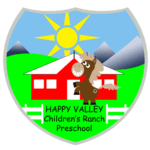 Happy Valley Ranch Preschool believes in delivering the highest quality preschool experience for your child. That is why our teacher to child ratio is 1 to 6 and our curriculum and lesson plans are aligned to the Colorado Early Learning Guidelines and Colorado Academic Standards. Our teachers have either Master, Bachelor or Associate level degrees in Early Childhood Education. The children are grouped by ages into four classes. "Popcorn" and "Peanut" classes are reserved for younger children “Bubblegum” and “Crackerjack” classes are for children preparing for entrance into kindergarten. The "Second Step" Curriculum is an early learning program that focuses on teaching important skills related to children's social and emotional development. It focuses on skills such as listening, focus, empathy, emotion management, friendship skills, and problem solving. The “Get Set For School” curriculum is used to teach cognitive skills. Through music, movement, building, coloring and multi-sensory activities, children have fun as they develop important school readiness skills. A $75.00 per student and $40 per sibling non-refundable fee is due at the time of registration. Program space is limited and this will hold a space for your child. Tuition is due the first day of each month and considered late after the 15th. A $20.00 late fee will be assessed for tuition payments that are submitted after the 15th of the month. All tuition must be paid with a check, bill pay, cash or money order. Billing is made in 9 equal payments: September through May. A $25 processing fee will be charged for returned checks. Once a spot is reserved for a child, staffing is planned and supplies are purchased. Therefore, the tuition fees are not refundable or available for credit to another month. Refunds are not available for illness, occasional absences, snow days, vacations, and day’s closed or early withdrawal from preschool. We are not able to accommodate “drop in days”. To see the Schedule and Fee rates go to the Enrollment tab or by clicking here. School Supplies or $40 in lieu of are required for each child. The school supply list will be posted on the website. School supplies or fee will be due on the designated school supply drop off day scheduled in August. The school supply list can be found by clicking here or under the Enrollment tab or clicking here. For all classes, there is a fee of $16 per student to cover the cost of the Learning without Tears Curriculum activity books used throughout the year. This fee will be applied to the invoice for the first month of tuition. Join us on a six-week journey of nature and science from June 10th through July 25th. Happy Valley offers a 3 hour morning Summer Fun Program, two days per week from 8:30-11:30 AM or 8:45-11:45 AM for children ages 3 through 6. The choice of days is Monday and Wednesday or Tuesday and Thursday. The children will be learning about a nature and science concept each week. Your young scientist will enjoy fun themed pretend play, outside games, interaction with our farm animals, science experiments, crafts, water week and more! In addition to offering crafts, music, games, story time, water-play, pony rides, and animal petting pen, we provide a healthy snack consisting of fruits and vegetables. Registration for the Summer Fun Program is now open. Water Week - A week filled with playing with water, cool pools, fun water slides, and wild sprinklers for children to experiment with and enjoy! Fun with our Happy Valley Farm Friends - The children will love riding our ponies: Cinco, Orbit, Magic & Sky! They will also spend time with our goats Daisy and Otis, our pig Charlotte and Mify the rabbit in our outdoor petting pen. Family Fun Day - Featuring: The Mad Science Show - Spin, Boom, Pop! - This spellbinding special event introduces children to a world of exciting chemistry defying gravity with didgeridooes, foaming hands and steaming chemical reactions! Parents will be invited to join us! Program Fee - The price for 6 weeks is $410.00. A payment of $100.00 is due at the time of registration to hold your child’s spot and is non-refundable. The balance of $310.00 is due the first day of summer camp. Registration Forms will be made available in January 2019.